The Australian Financial Review reports that AGL Energy is considering listing a spin-off company that works with coalminers to extract coal seam gas before mining begins. This would provide gas for energy, make the mines safer and reduce any carbon tax liability for the miners. The idea relates to AGL's 35 per cent interest in CSM Energy. However, AGL's upstream gas group's general manager Mike Moraza is reported as saying there are no immediate plans. DUET Group has reported a statutory net profit of $188.4 million for 2010-11, up 8 per cent on 2009-10. Revenue of $1,059 million was up 7 per cent. Earnings per stapled security were 21.9 cents, down 11 per cent. Chief executive David Bartholomew said "It has been a solid year for DUET, with our portfolio of regulated utility assets delivering strong growth in both proportionate revenue and EBITDA." Earnings (EBITDA) at Dampier Bunbury Pipeline increased 14 per cent thanks to a higher contribution from the Stage 5B expansion project. United Energy's earnings (EBITDA) was up 4 per cent due to an increased contribution from the smart meter program and the new regulatory tariff that became effective on 1 January 2011. Multinet's earnings (EBITDA) was up 6 per cent reflecting its CPI linked tariff, plus strong demand and growth in connections. GWA Group has sold its Sebel Furniture business and related entities to Krueger International, Inc (KI), a US international commercial furniture supplier. GWA managing director Peter Crowley said the sale is a good outcome for GWA and allows it to focus on its strategy to grow in the Australian building fixtures and fittings segment. The estimated sale price is $24 million. Sebel will be recorded as a discontinued operation in GWA's December 2011 half year accounts with an impairment loss of approximately $0.5 million. Transaction costs and foreign exchange translation are expected to increase the loss after tax to $2 to $3 million range. The sale agreement is conditions but expected to complete by the end of September. GWA's net profit for 2010-11 rose 14 per cent to $63.4 million for continuing operations and earnings per share increased to 21 cents. The final fully franked dividend has been maintained at 8.5 cents per share bringing the full year dividend to 18 cents, a payout ratio of 86 per cent. Mr Crowley said "Our businesses have performed well to deliver a result within our EBIT guidance range of $105 to $111 million, despite weak trading conditions in the second half of the year. Benefits from Government stimulus spending on public housing and the Building Education Revolution program ended around the time underlying market demand weakened in the second half. "We expected like for like underlying Australian demand to increase by 3 to 4 per cent for the year but this was nearer to 1 per cent due to market conditions". Sales by the Heating and Cooling segment increased 21 per cent with the inclusion of full year sales from Brivis Climate Systems which was acquired in April last year. Earnings (EBIT) rose 18 per cent from $14.6 million to $17.2 million with the inclusion of Brivis and improved performance from the Dux water heater business in the second half of the year. Mr Crowley said "The strong Australian currency and high Australian costs will require further restructuring in 2011/12 to maintain our competitiveness. This will reduce our workforce by approximately 8 per cent during the year and increase the proportion of product sourced offshore. "We are committed to Australian manufacturing where it supports our competitiveness. This is demonstrated by our current investment to upgrade the Dux water heater factory at Moss Vale and further planned capital expenditures at the Caroma sanitaryware factory at Wetherill Park." "Restructuring costs and related capital investment will cost approximately $20 million but we expect the profit and cash impact to be largely offset in the year through property sales and working capital management improvements." Meanwhile, the Sydney Morning Herald has reported criticism from the Australian Shareholders' Association that "'GWA is a fairly typical example of everything that is wrong about the status quo of executive remuneration packages in Australia." The report says proposed changes to Mr Crowley's incentive package skew the incentive payments towards the short-term. Infigen Energy said its provisional result for 2010-11 is statutory earnings (EBITDA) of $159.3 million. This based on Australian operating earnings (EBITDA) of $86 million, US operating earnings (EBITDA) of $81.4 million, corporate costs of $18.7 million, and development costs of $3.9 million. Infigen said its total production and revenue for 2010-11 were at the upper end of guidance. Subject to final audit, total revenue was $292.8 million - from the US $150.4 million, from Australia $117.2 million, and from Germany $25.2 million. The revenue outcome for Australia and Germany reflect stronger than expected prices relative to guidance assumptions for the second half of the financial year, it said. A full year of production from the Lake Bonney 3 Wind Farm and an additional four months contribution from the Capital Wind Farm together contributed an additional $21.8 million to revenue. At 30 June Infigen held 244,000 unsold Renewable Energy Certificates (RECs) with a book value of $8.8 million at an average book value was $36.05 per REC compared with a closing market price of $39.60 at 30 June. Infigen expects to report 2010-11 revenue of $267.6 million from its Australian and US businesses compared with $263.8 million for 2009-10. Total production was 4,868 GWh, of which 3,332 GWh was from the US, 1,335 GWh from Australia, and 201 GWh from Germany. Tox Free Solutions saw 2010-11 net profit from continuing operations jump to $11.8 million against $7.9 million in 2009-10. Revenue was $143.5 million, a 45 per cent increase. Earnings (EBIT) increased 51 per cent to $21.3 million. Earnings per share rose to 12.89 cents from 9.25 cents. The dividend has been increased to 3 cents per share fully franked. Clean TeQ Holdings has entered into a loan agreement with Aqua Guardian Group (AGG) that allows it to borrow up to $1 million. This be main be used by Clean TeQ to repay the outstanding principal and interest due on the convertible note held by La Jolla Cove Investor, Inc and avoid its conversion to shares. Interest on the AGG loan is on the drawn balance at 10 per cent per annum and the loan is to be repaid by 31 December 2011. To fund the repayment, Clean TeQ will undertake a $1 million non-renounceable rights issue offering two new shares for every seven at 3.7 cents per share. The net proceeds of CMA's entitlement offer will assist the company to refinance and repay a significant amount of its bank debt, which will materially improve CMA's credit profile. Together with the new equity it will have additional working capital to significantly enhance its ability to increase scrap metal purchase volumes from suppliers and increase production, said chairman, Parag-Johannes Bhatt. "CMA's current levels of scrap processing utilization in Australia is approximately 50 per cent in most locations, which provides significant capacity upside. Due to high debt level in the Australian business, over the past 18 months working capital has been very limited and hence CMA has been unable to purchase sufficient quantities of scrap to operate its facilities at anywhere near maximum efficiency," he said. The proposed recapitalization should put the company in a position to ramp up its scrap purchases and increase the utilization and efficiency of its assets. "This should result in a substantial improvement in the company's operations and profitability." Mr Bhatt said substantial cost savings have been achieved to date as a part of the restructuring. These include a significant reduction in staff numbers, and a significant reduction in annual property costs due to the successful settlement of litigation against WMR Investments Pty Ltd and former managing director Doug Rowe. Other measures have included the sale of CMA's contracting business, the placing of the Meretec de-zincing business on a care and maintenance basis, and the sale of obsolete and underutilized plant and equipment in the demolition business. Mr Bhatt said CMA has written off significant tax assets of approximately $37 million in its December 2010 accounts, and on the basis that the company is recapitalized as foreshadowed, minimal tax should be payable in the following two to three years. Qube Logistics unitholders have overwhelmingly passed resolutions to corporatize the business and internalize management. million in new Qube shares at an issue price of $1.3856. Qube Logistics reported a profit after tax for 2010-11 of $61.8 million, an increase of 154 per cent. "The result reflects the continued growth in earnings and positive outlook for both the Landside Logistics and Automotive, Bulk and General Stevedoring operating divisions," said the company. Clifford Ashby has resigned as managing director and chief executive of Clean Seas Tuna. He leaves in October to take up a senior position with a leading agribusiness group. However, he will continue with Clean Seas Tuna as a non-executive director. An international search is being undertaken to find a new CEO. Independent director, Paul Steere, will be interim CEO if a replacement is not found before Mr Ashby's departure. Mr Steere has extensive aquaculture and commercial experience. He was chief executive of New Zealand King Salmon for 15 years and built the company to become the largest Chinook salmon farmer in the world. Clean Seas Tuna made a post tax loss for 2010-11 of $32.4 million. This includes a write-off of $17.6 million of future tax benefits associated with carried forward tax losses. The board said this was due to uncertainty as to when the tax losses would be realized, but the tax losses remain available and the company will not pay tax for some time after it becomes profitable. The full year's operating results were impacted by write-downs of the discontinued retail product range, lost growth due to higher than budgeted mortalities and colder than average water temperatures; and the strong Australian dollar. However, the Kingfish business was cash-flow positive for the full year, achieved through the one-off sell down of excess inventory, farmgate price increases and cost saving measures. "Importantly, the company anticipates the Kingfish business will remain cash-flow positive for the coming financial year and that its balance of production to sales, together with further reductions in operating costs, will bring the Kingfish business closer to being a long term sustainable and profitable business," said the company. Dyesol and partner Tata said their last two milestones were presented to the Welsh Government (WG) with a short summary of the successful development of dye solar cell on coil coated steel (DSC on Steel). The final milestones were a completed study of process capabilities  a precursor to volume production, and a comprehensive review of intellectual property relevant to DSC on metal strip  a demonstration of value generation from the £5 million investment by the WG in the project. Feedback from the WG is that the project had made an excellent contribution to science and technology in Wales, they said. "The WG re-iterated their support in facilitating the continuation of the DSC on Steel project, and indicated that Wales had already become a global centre of excellence for DSC, with the largest DSC product development facility in the world being located in Wales. ERM Power has welcomed a farm-in agreement between its partner Empire Oil & Gas NL and Origin Energy. ERM managing director and chief executive Philip St Baker said ERM Power had a long history of working with Origin and looked forward to Origin joining the EP 426 joint venture in the North Perth Basin of Western Australia. "This transaction will lead to a greater understanding of the large North Erregulla prospect whilst significantly reducing ERM Power's capital requirements in the tenement," he said. Origin has agreed to the key commercial terms to earn a 40 per cent interest in each of two petroleum exploration permits (EP) in the Basin, EP 426 and EP 368. The interest is to be earned by Origin operating and paying 80 per cent of the costs of a 100 square kilometre 3D Seismic Survey over an area within EP 426 and EP 368.
target the tight gas sands and shales of the Laurel formation within a large conventional structure with the potential to host significant quantities of hydrocarbons. Green Rock will earn a 15 per cent interest in EP 417 by paying 27.5 per cent of the Lawford#1 total well cost up of $4 million, about $1.1 million, and 15 per cent of cost above $4 million. The drilling agreement with Buru triggers a payment of back costs by Green Rock to NSE of $250,000 with a final $300,000 due on commencement of drilling at Lawford #1. The expectation is for the Lawford #1 well to spud during September and deepening of the well to take two to three weeks to reach the revised target depth of 2,800 metres. MediVac subsidiary SunnyWipes has appointed Critical Dental as its exclusive partner in the Australian dental market for its range of professional Antimicrobial Hand Sanitising Gels and General Virucidal & Antimicrobial Workplace Wipes. Critical Dental is a leading distributor of equipment and consumables within the Australian dental market. Following a recent capital rasing deal with La Jolla Cove Investors, La Jolla has begun converting the con note to shares. MediVac said that such conversions were announced on July 25, August 1, August 8 and August 15. Mission NewEnergy said it has signed a contract to supply sustainability-certified biodiesel to a global oil major. The six month contract commences in January 2012 and is expected to generate revenue of over $40 million. 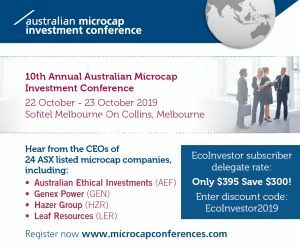 Pacific Energy has reported a loss after tax of $2.1 million for 2010-11.The loss is based on writedowns associated with a decision to cease work on its planned 25 MW baseload biomass fueled renewable energy power station 30 kilometres north of Perth. "The project has been shelved due to an inability to negotiate a mutually acceptable price for the renewable energy to be generated by the project with the WA State Government owned electricity retailer, Synergy," said the company. "We were also unable to secure a commitment from the WA Government to consider the direct payments and cost savings of the Project to the non-Synergy WA State-owned corporations participating in the project nor the cost saving benefits of the supply of "base load" renewable energy to be generated relative to the capacity procurement and intermittency related costs of wind generated renewable energy." On the plus side, Pacific Energy said that record earnings from its Kalgoorlie Power Systems (KPS) business during the 12 months to 30 June helped deliver a 78 per cent increase in adjusted net profit after tax to $8.4 million. The adjusted profit after tax is the reported net profit after tax pre losses from the write-off of all capitalized expenditure relating to the Perth Bio-energy Project, non-cash amortization charges, non-cash revaluation adjustments, subscription fees paid on early issue of shares, "one off" asset sale charges/ benefits and the related tax effects. Electricity storage system company RedFlow is to raise up to $16 million through a $12 million placement to institutional and sophisticated investors and a share purchase plan for up to $4 million. The placement shares will be issued at $1 each. The funds will accelerate the introduction of the large scale outsourced manufacture of the company's zinc-bromine battery modules (ZBM); support product roll-out in selected markets; and for working capital. In June, RedFlow appointed Jabil Circuit, Inc as its outsourced manufacturing partner. Southern Crown Resources' recently completed detailed orientation sampling and ground radiometric survey at the Nkombwa Rare Earth Element (REE) project in northern Zambia has returned highly mineralised samples. Of the 476 rock chip samples, 24 samples had Total Rare Earth Oxides (TREO) of over 5 per cent, with the highest values being 10.07 per cent, 12.12 per cent, 12.55 per cent and 15.37 per cent. 43 samples had TREO concentrations in excess of 3 per cent. Grid sampling undertaken in November 2010 reported sample results as high as 22.09 per cent TREO. Managing director, Jock Harmer said "These results are very encouraging as they demonstrate that large areas of the Nkombwa complex host high levels of REE mineralization. The results will allow the upcoming drill program to target the main areas of mineralisation before the onset of the wet season,"